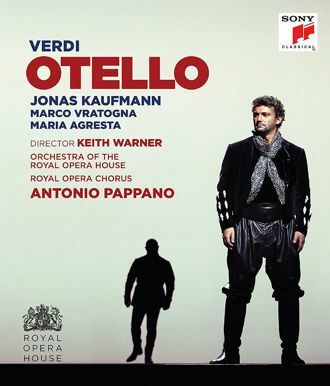 The build-up to Jonas Kaufmann’s first appearance as Verdi’s Otello was intense. Not since Plácido Domingo essayed the role a generation earlier have expectations been pitched so high as on the night when Kaufmann stepped on to the stage at the Royal Opera House last year as the centrepiece of a new production. In the event the general verdict was good, but underwhelming. Even Domingo was thought to be vocally a touch on the small side at the start and Kaufmann’s tenor is at least one size smaller again. On this live DVD, though, size of voice is less important than artistry and dramatic impact. The noble, burnished warmth of Kaufmann’s tenor is right, and his musicality is impeccable, a constant pleasure throughout this performance. He makes a deeply thoughtful, romantic figure out of Shakespeare’s tragic hero, though not one who seems prone to jealousy or rage, which is difficult given the story, and certainly not a wounded lion of a man, as Jon Vickers used to play him. Even so, Kaufmann is the number one reason for buying this album. It might be tempting to say the only reason, except that Antonio Pappano is a strong force down the pit, drawing impressive playing from the Orchestra of the Royal Opera House. Maria Agresta’s Desdemona and Marco Vratogna’s Iago have the advantage of being native Italians, but she lacks beauty of sound and he is rough-hewn and dry of voice. It is hard to find anything positive to say about Keith Warner’s production. It looks even more gloomy and static on film than it did in the theatre, and its set pieces are horribly contrived. Any dramatic force it exerts is thanks to Kaufmann, the raison d’être of the production, and equally so of this DVD.